Compass Control represents the first fully integrated major control system built from the ground up to use Apple's iOS devices – iPad®, iPad mini®, iPhone®, and iPod touch® – as its backbone. With the power of iOS and the Compass Control App for the iPad, iPad mini, iPhone, and iPod touch, control for your dream system has become a reality thanks to simple swipe gestures and the simplicity of Compass Control’s beautiful graphic interface. Using Key Digital’s Compass Navigator™ software, programming a Compass Control device is an intuitive step by step process utilizing simple ‘drag and drop’ gestures. Compass Control delivers your music and audio content where you want it. Whether in the ceiling, in surround sound, or through intuitive metadata feedback from your audio device. Compass Controls makes these advanced systems as easy as a push of a button. Easily manage multiple rooms with Compass Control. Each zone can be managed individually or all zones can be managed together. You can power zones on or off, change the source for zones, and mute or change the volume for zones. 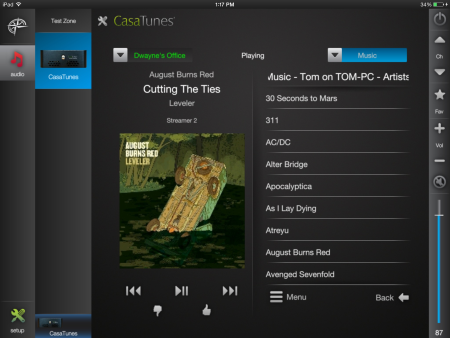 Compass Control leverages CasaTunes’ REST APIs, providing two-way control and a robust feature set for customers. With Compass Control you have full control of your music in any room. You can browse, select and listen to any music from any of the CasaTunes music services available, with full metadata feedback. Compass Control is compatible with all CasaTunes music systems.